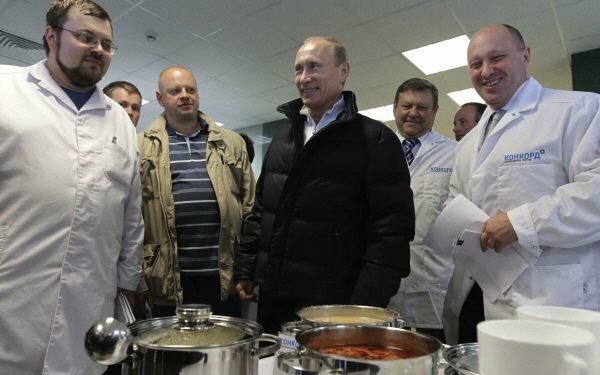 In 2012-13, the Russian media began to pay attention to another 'friend' – Putin’s ‘personal chef’ Yevgeny Prigozhin. President of the Concordcatering company, Prigozhin also has other responsibilities: he is the man who set up a ‘trolling office’ (otherwise known as the Internet Research Agency) just outside St Petersburg, in which students are paid to write comments online, slandering the West and glorifying Putin. This ‘trolling office’ is run by people from the ranks of the largest pro-Kremlin youth movement in Russian history – Nashi. The organisation’s annual forum in Seliger has been attended at various times by Vladimir Putin, Dmitry Medvedev and several other senior officials. Pro-Kremlin publication Izvestiya rather surprisingly tried to ascertain whether the awarding of the contract to Concord was due to Prigozhin’s close relationship with Putin. In the course of their enquiries, however, Prigozhin hung up, declaring that he did not want to listen to their questions. 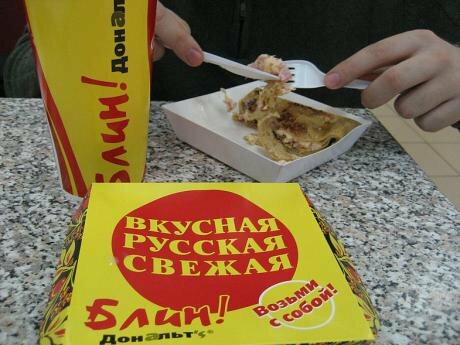 The Concord company group owns several major restaurants in Moscow and St Petersburg. Prigozhin’s most well-known enterprises, however, resulted from his close connection with state authorities. In 2009. 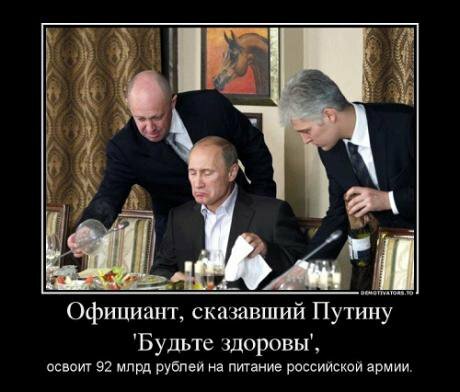 Prigozhin’s company opened the first, and to date only, private restaurant in the Russian parliament building. The company was also contracted to provide catering for the St Petersburg International Economic Forum, and organised gala dinners on behalf of former governor of St Petersburg Valentina Matvienko, and for the inauguration of President Dmitry Medvedev. It took 53-year-old Yevgeny Prigozhin just 11 years to make the journey from being the owner of expensive restaurants to a major contractor of the Defence Ministry – how that came about is a story by itself – and the largest provider of catering to Moscow’s schools. However, Prigozhin is not keen to share the secrets of his success with journalists. He has given just one interview – several years ago, to a St Petersburg magazine; and now categorically refuses to speak to the media. But it is known from publically available information that on 29 November 1979 in Leningrad’s Kuybyshev court, Prigozhin was convicted of theft, for which he was put on probation. Just two years later, he received a custodial prison sentence from the Zhdanov court for more serious crimes. In 1988, Prigozhin was pardoned, and in 1990 released from a penal colony. Lack of information has led journalists to form at least two conspiracy theories explaining Prigozhin’s close ties with Vladimir Putin. According to Novaya Gazeta, Yevgeny Prigozhin set out on his journey to commercial success in St Petersburg's gambling business. Prigozhin’s rapid rise began during the 1990s when he was working in the gambling business; a rise which coincided with that of Vladimir Putin. By a decree of the then St Petersburg mayor Anatoly Sobchak, Putin was appointed to chair the newly created supervisory board for casinos and gambling businesses. Furthermore, in accordance with Sobchak’s 1993 decree, licences to engage in gambling services were issued by the same supervisory board, chaired by Vladimir Putin. ‘Vladimir Putin himself saw that I am not above waiting on royalty, since they were my guests’ – said Prigozhin in his only interview with a St Petersburg magazine. By the time Prigozhin waited on Putin at his restaurant, he already owned middle-range and luxury restaurants across St Petersburg, from Staraya Tamozhnya (Old Customs House) to Russky Ampir (Russian Empire). It was, perhaps, not a coincidence that after he met and formed close ties to Vladimir Putin, the businessman was able to enter the Moscow market, and frequently won government contracts. Some of Prigozhin’s business ventures have been less successful. 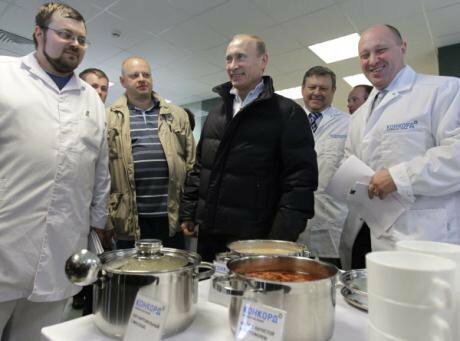 He attempted to roll out a chain of cheap fast food restaurants, but feeding the rich, it seemed, was better business for Putin’s personal chef. Despite support from the authorities and a massive advertising campaign on all television channels, the chain could not withstand the competition. Although the company had planned to open up to 20 restaurants, by 2008 there were barely 10; and by 2009 it had started to close restaurants. The last one closed its doors in 2011. The 10 restaurants had been opened against a background of endless scandals. Concord was determined to achieve its goals, deciding not to rent premises for the restaurants, but to build them itself – in violation of the law. In 2006, residents of one district held a protest against the destruction of a public square in which 16 trees were cut down. Their placards read ‘less green in our city – more greenbacks in officials’ pockets’. Residents of the area near the square collected 3,000 signatures in protest. With the help of deputies in the St Petersburg city parliament, they were able to file an application with the prosecutor’s office to bring criminal charges against the leadership of Agat LLC – a company owned by Concord. The prosecutor refused to do so, though he did conduct an investigation into possible administrative violations. Agat had commissioned Green Cross to carry out an environmental review of the project. The organisation has a wholly negative reputation amongst St Petersburg ecologists, who suspect that Green Cross enriches itself by providing favourable reviews to those who can pay. After much criticism, the leader of Green Cross Yury Shevchuk revealed that his organisation had conducted its review using the architects' project drawings, rather than by visiting the site. ‘The governor had decided in favour of this project and was supported in this by the local authorities,' explained Shevchuk, ‘so we were not able to carry out an investigation of the proposed building site.’ Why the governor has any authority in such a situation, and on what basis he decides where to build are questions which remain unanswered. Industry experts consider that the chain failed because Concord was simultaneously working on a catering programme for schools. The company had begun to use its production capacity both for catering in schools and social institutions; and for selling food through retail outlets – a dual strategy which proved problematic. In 2009, Concord won the tender to provide school lunches to St Petersburg schools without their own canteens, for which the company built a canteen and food processing combine in 2010 in the village of Yanino, Leningrad Region at a cost of 1.7 billion roubles. Its opening was attended – once again – by Vladimir Putin. Schoolchildren and their parents repeatedly complained about the quality of the food provided, which was neither tasty nor fresh. In autumn 2011, parents of Moscow schoolchildren even blocked a lorry bringing food from Concord to a local school. The children refused breakfast and lunch and complained to their parents of stomach ache, leading parents to go to school, and monitor the quality of the food themselves. Yet Yevgeny Prigozhin’s company did not suffer as a consequence. In addition to his trolling office, Yevgeny Prigozhin has launched several projects dedicated to demonising the West and glorifying Russia. For example, six months ago he sent his people to America to shoot a film about Russian émigrés who regretted moving to the USA. Documents sent to Olga Dzalba, financial director of the Internet Research Agency, revealed that one of these potential returnees from the USA – Andy – ‘[was] to be paid 50,000 roubles.’ Dzalba is the business partner of one of the Internet Research Agency’s top managers – Aleksei Soskovets, who is personally responsible for the admission of new ‘trolls’. These young people run the Neva Entertainment company, which has over the past three years consistently won contracts to organise celebrations and entertainment for the St Petersburg city administration. In Russia, of course, such success in receiving contracts from government authorities indicates a very close relationship with them. While Prigozhin’s other ‘specialists’ flew to the USA looking for homesick Russian emigrants, Dzalba took part in his ‘Ukrainian project.’ Prigozhin’s people set up a new project in Kharkiv – the Kharkiv News Agency, whose main task was to write posts imitating a people’s movement against the Euromaidan, among Ukrainian internet users. But nobody has yet been able to come up with a satisfactory explanation as to why it is that ‘the President’s chef’ started spying on the few remaining publications in Russia which criticise his boss. Requests for an explanation from Concord as to how Prigozhin’s culinary empire is consistently awarded lucrative government contracts, and why his name features on the Internet Research Agency’s documents have all been ignored. In Russia, it is not always easy to get into the kitchen.